Talent Cellars is a premier Southern Oregon Winery, focused on sourcing the highest quality grapes and crafting high-end wines. Winemaker Matt Newbry and his wife Janéa, attribute the inspiration behind Talent Cellars to the very soil their family has been farming in Talent, Oregon since the 1920's. With generations of Southern Oregon agricultural heritage, Talent Cellars aims to honor the hard work of those who came before by producing wines that captivate the palate and spirit. The allure of creating something of value by getting up at sunrise, working the soil and putting your blood-sweat-equity into a craft was inspired in Matt and Janéa at early ages. Matt fondly remembers following his Grandfather around Newbry Orchards, and Janéa thinks back to her charmed childhood memories of being raised on a farm. Now together, Matt and Janéa are excited to bring the Talent Cellars vision to life by hand-crafting exceptional wine. A pivotal part of the Talent Cellar’s vision is sharing it with you and ensuring your experience is one that captivates your palate and spirit. Matt and Janéa are working hard to bring you an unparalleled experience by selecting grapes from the most renowned vineyards of our region, and then crafting them barrel-by-barrel. As you savor a glass of Talent Cellars’ wine, you can taste the skill of the winemaker who not only has the educational background but also the hands-on experience through his collaboration with world-class wineries. The combination of Matt and Janéa’s strong work ethic and progressive winemaking practices, results in a wine experience that will leave you wanting more. Please join them on their venture and experience all Talent Cellars has to offer. TALENT CELLARS IS EXCITED TO OFFER OUR "TALENT CLUB" MEMBERSHIP. THERE ARE THREE DIFFERENT MEMBERSHIP LEVELS WHICH CAN BE FOUND BELOW OR BY CLICKING THE "CLICK TO JOIN NOW" BUTTON. CLUB RELEASES WILL SHIP TWICE A YEAR IN APRIL AND OCTOBER. MEMBERS WILL RECEIVE 10% TO 20% DISCOUNT DEPENDING ON MEMBERSHIP LEVEL AND WILL HAVE ACCESS TO TALENT CLUB ONLY WINES, EVENTS AND OFFERS. FIND OUT MORE BY READING BELOW OR CLICKING ON "CLICK TO JOIN NOW." PLEASE FEEL FREE TO CALL 541-767-8509 OR EMAIL AT INFO@TALENTCELLARS.COM WITH ANY QUESTIONS OR FOR HELP WITH THE CLUB SIGN UP PROCESS. Become a Charter Member TODAY! The allure of creating something of value by getting up at sunrise, working the soil and putting your blood-sweat-equity into a craft of your choosing was instilled in Matt at an early age while following his Grandfather around Newbry Orchards. The fascination of winemaking was a seed planted by his father, as he recounted his stories of small-scale rudimentary wine-making. Those early winemaking “seeds” began to be cultivated when he took an enology class his senior year while attending Washington State University. Yet Matt took the scenic route to fulfilling his passion with segways such as advocating for businesses while working at the Department of Commerce. That’s when he met and married the love of his life, and the wine-making seed that was planted at an early age was realized with the support and enthusiasm from his new bride. Making life-altering changes, he set a new course bringing him and his growing family back home to Talent, Oregon, where his family had been tilling the soil since the 1920’s. Since then, Matt worked seven harvests at Tamarack Cellars in Walla Walla, Washington while simultaneously completing his degrees in Viticulture and Enology. “I continue to be so grateful to the owner, head wine-maker and crew at Tamarack cellars for truly taking me under their wings and giving me a hands-on education that is priceless. This helping-one-another attitude you find in the wine industry is so refreshing and beneficial”. Right out of the gate, Matt gravitated to crafting balanced and elegant cabernet sauvignon wines, but as Talent Cellars grows he looks forward to expressing his craft in other varietals. So to all you white-wine lovers, stay tuned for future releases! Janéa is no stranger to agriculture, as she grew up on a family farm where they raised horses, cattle and hay. She was serving in the Washington State Senate, where she ironically chaired the committee that advocated for winery and small business issues, when she met and fell in love with her husband, Matt. It was a perfect transition for her to return to her agricultural roots and pursue their dream of establishing a family winery. The cherry on top was their ability to come home to Talent, Oregon where the Newbry family’s agricultural roots date back to the 1920’s. Janéa continues to be Matt’s greatest advocate when it comes to pursuing his passion of crafting exceptional wine that captivates the palate and spirit. Makaio Newbry, the eldest son of Matt and Janéa, is a surprising contributor in all family affairs. 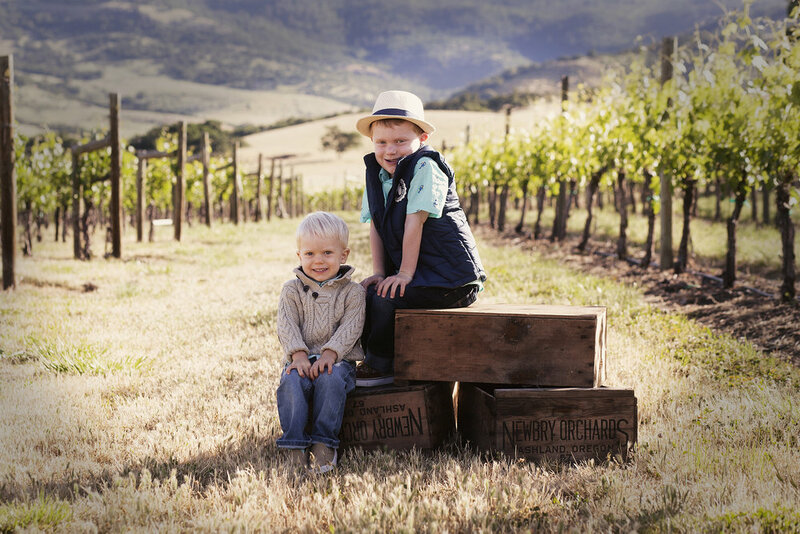 Although just four years of age, Makaio is mighty in his contributions to the family winery. There is no winery task too big or small that he won’t attempt to fulfill. His natural ability towards all things wine-related argues for a genetic aptitude in the Newbry blood-line. Jax the youngest Newbry is all about following the footsteps of his father and out-doing his older brother. His special talents include caring for the family dog, Kona, and tasting the fruit as it comes out of the vineyard. Thank you for your INTEREST in our family WINERY. If you would like to know more about Talent cellars as we progress, we would be pleased to receive your contact information for our private customer list.